Quality fixtures and fittings throughout this 150sqm, 2 bedroom duplex apartment located in the well-established Chateau Dale complex. The apartment has a lounge, bathroom and Western fitted kitchen on the ground floor, with 2 bedrooms and 1 bathroom on the upper level. Enjoy pool, garden and partial ocean views from the balconies. 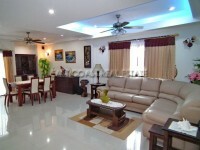 The building features large communal pool, excellent security and is on taxi bus routes to Central Pattaya. The condominium is also within easy walking distance to a large Supermarket, the beach and Jomtiens many restaurants, bars and nightlife.